Are you looking for midsize luxury sedan that separates itself from the humdrum models of the segment? Named the “Fastest Growing Automotive Brand in the U.S. in 2016”, the Jaguar brand will cater to automotive connoisseurs with a perfect combination of athletic style, luxurious interior, innovative technology and elite performance. Explore the high-powered Jaguar XF in depth with a 2017 Jaguar XF vs 2017 Mercedes-Benz E-Class comparison that pits the Jaguar brand against a luxury mainstay. Available in five trim levels - Jaguar XF, Premium, Prestige, R-Sport and S - the luxurious 2017 Jaguar XF can be tailored to fit your specifications. Armed with a sleek exterior, a luxurious interior, performance-tuned engine options and an extensive list of standard features, the Jaguar XF fits the bill as your next dream car. Highlight features include a standard eight-inch Jaguar InControl® touchscreen display, an 11-speaker Meridian sound system, a power sunroof and more. Upgrade your experience and opt for the Technology Package with a 10.2-inch touchscreen, an LED gauge cluster and a 17-speaker sound system. What Are the Differences Between the Jaguar XF and Mercedes-Benz E-Class? Price and affordability are key components of any car-buying decision and play an important role in this 2017 Jaguar XF vs 2017 Mercedes-Benz E-Class comparison. With a starting price that stands at $48,250, the Jaguar luxury sedan is the the more affordable model in this debate, with the stock Mercedes-Benz E-Class priced at $52,150. When you pair an affordable price with a power-packed performance, the Jaguar XF stands apart from its Mercedes-Benz competitor. 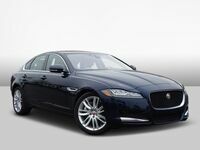 Power and performance are highlights of the luxury sedan class and the Jaguar XF will check all the boxes. A 340-horsepower 3.0-liter supercharged V-6 power plant is married to an eight-speed automatic transmission with rear-wheel drive and sets the bar high for competitors. Available all-wheel drive incorporates All-Surface Progress Control and Adaptive Surface Response technology to deliver precision handling and track-ready traction when you get behind the wheel. Drivers who select the Jaguar XF S trim will benefit from a refined supercharged 3.0-liter V-6 that amplifies power output to 380 horsepower. An element that sets the Jaguar XF apart from competitors is the available diesel engine. Armed with the 180-horsepower 2.0-liter turbodiesel four-cylinder engine, the Jaguar XF will manufacture an incredible 318 pound-feet of torque. Married to an eight-speed automatic transmission, the diesel-powered Jaguar XF is expected to make 31 mpg in the city and 42 mpg on the highway. 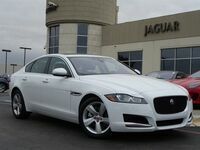 Jaguar XF models equipped with the diesel engine are available with all-wheel drive. When you explore the 2017 Mercedes-Benz E-Class engine lineup, you may find yourself overwhelmed with the available engines. Despite a veritable smorgasbord of engines, you will be hard pressed to find a model that will keep up with the Jaguar XF. Stock Mercedes-Benz E300 editions employ a spritely 241-horsepower 2.0-liter turbocharged four-cylinder engine paired with a nine-speed automatic that delivers lackluster performance. An upgrade to Mercedes-Benz E400 variants adds a 329-horsepower 3.0-liter turbocharged V-6 that still falls short of the Jaguar XF base engine. Mercedes-AMG E43 and Mercedes-Benz E550 models prove to be the only Mercedes-Benz E-Class models that can keep up with the 2017 Jaguar XF. Get behind the wheel of the 2017 Jaguar XF today when you visit Barrett Jaguar in San Antonio!